Spicy, but not too spicy, that's how I like my chicken alla diavolo. (pronounced Dee-AHvolo). Devil's Chicken. This recipe is from La Cucina Italiana magazine and it was a nice change to my weekly roast chicken. Ask the butcher to butterfly the chicken for you by removing the breast bone, it makes life so much easier. Position rack in upper third of oven; heat to 425°. Put chicken, skin-side up, into pan. In a small bowl, stir together mustard, black pepper, marjoram, rosemary and red pepper flakes. Spread mustard mixture over chicken, distributing mixture evenly; season with salt. 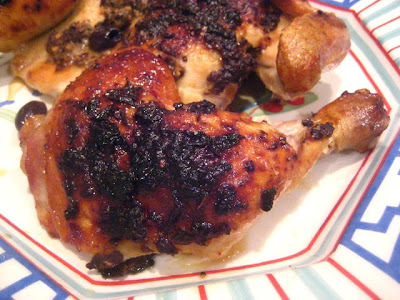 Drizzle chicken with 1 teaspoon oil. Bake chicken for 20 minutes. Sprinkle olives over chicken, if using, add wine to pan and continue baking until skin is golden and chicken is cooked through, 30 to 35 minutes more. 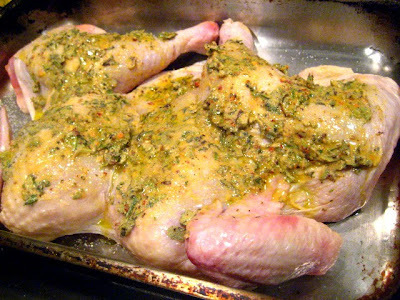 Transfer pan to a wire rack and let chickens rest for 5 minutes, spooning juices over the top. Serve with juices. Looks like another great recipe from one of my favorite magazines. That does sounds like a nice change up for roast chicken. I'm lucky my butcher lives right in my house. Matt is always so proud of his chicken butterflying abilities. Never seen this recipe before, it looks awesome. I'm snowed in with at least 8 inches on the way, could be 12! I saw this and just pulled a chicken out of the freezer. Thanks for my morning inspiration. I've never used those spices on my baked chicken before. I bet it tastes as great as it looks. I am loving this chicken dish. Awesome flavors and it looks perfectly cooked. Look at that perfect char/sear! What a great variation on not-so-boring chicken! Stacey, this bird looks amazing! I especially like the dark caramelized pieces. I bet your kitchen had an incredible aroma while this bird was baking. Oh that look so yummy Stacey. Make me want to make it for supper tonight! A terrific preparation with olives, very unique and sounds like a must try! I'm not a fan of olives, but everything else looks perfect. Wow. Is there a non-alcoholic substitution for the white wine? Maybe chicken broth? This looks soo good! I love olives so I would certainly use them. Did the butcher at kings butterfly it for you? Stacey, you're right. This would make a lovely change from roasted chicken. I agree. The olives would really make this special. Stay warm up there in Jersey.